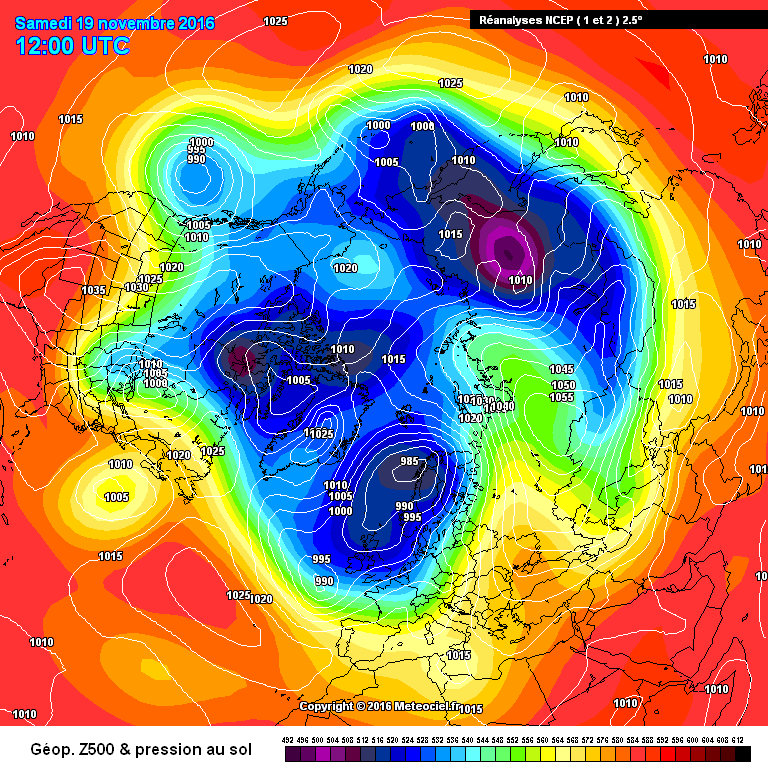 Ensemble mean on 18z at 120 high pressure to NE marginally stronger, troughing orientated slightly more N-S than on 12z. Little things built up like that over a couple of days could help keep high pressure more in place to the NE for longer. I think assisting in wave breaking and stress in vortex? With possible consequences down the line. Looking through ensembles at T240 IMHO I'd classify about five (25%) of them - tops - as having a healthy,strong vortex. Does anyone remember if that's normal for november? For so many ensembles with stressed vortexes to appear? Back again! Hope everyone is well! Holy Moses the 18Z has some very attractive members in the pack...trends? 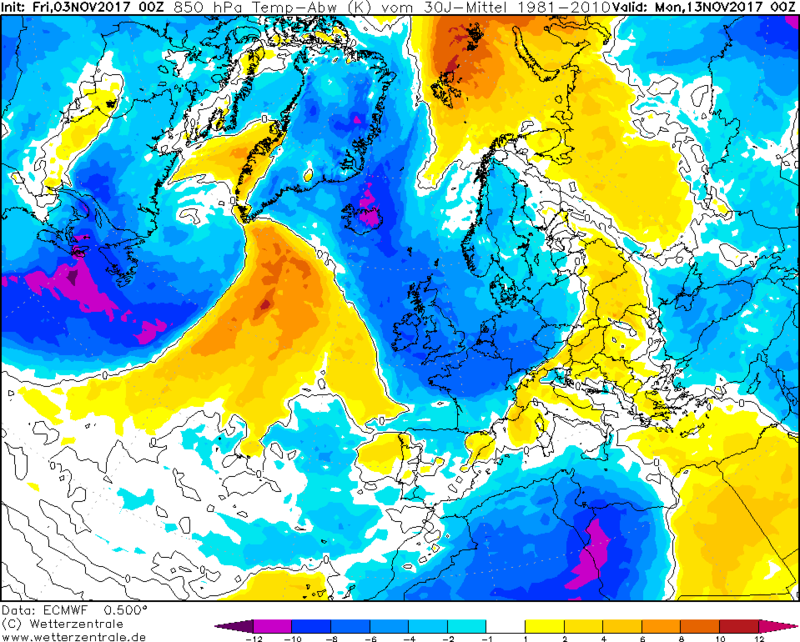 Last year was the same especially the second half of Nov there just seems to be an issue get heights far enough North. It went downhill rapidly after that point. In recent years, I'd say November has often seen a troubled vortex that has suddenly got itself together once December hits. So a blocked/disrupted NH not enough to go by, just yet. Getting the sense tonight, too, that the ECM ensembles are backing off from the Euro low, just like the GFS. 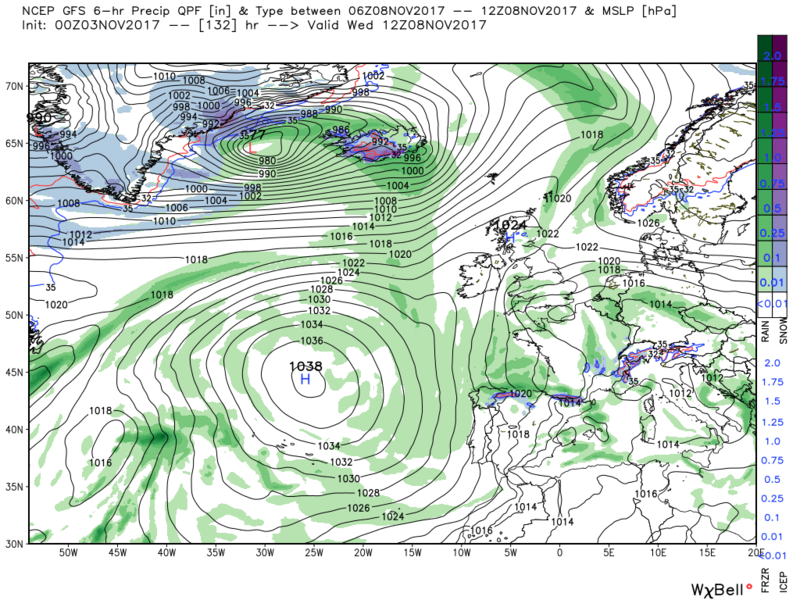 Heights from Azores High too strong D6-D10, leading to less disruption through Europe and a consolidated jet to our north. My above average punt for the CET looking safer tonight. Nothing to add this morning that differs from my comments vis the anomalies last evening. But by the afternoon fronts and light rain will encroach from the north west into Scotland and later N. Ireland.and then later on a frontal low will track north east through Brittany to bring rain to the south, Once this has cleared into the North Sea and the fronts have finished their journey south east the UK will be in a clearer, cooler north westerly airstream. From this point the Azores HP proceeds to ridge NE introducing a quiet spell of weather through Sunday and into Monday with an extensive air frost Monday morning But things are happening out west and a deep low 971mb is filling between Greenland and Iceland and by 00 Tuesday it's associated fronts, accompanied by rain, are orientated across Scotland and Ireland. Over the next 36 hours the front slowly struggle south east across the UK as a shallow wave forms on it and the resistance of the high pressure to the NE. 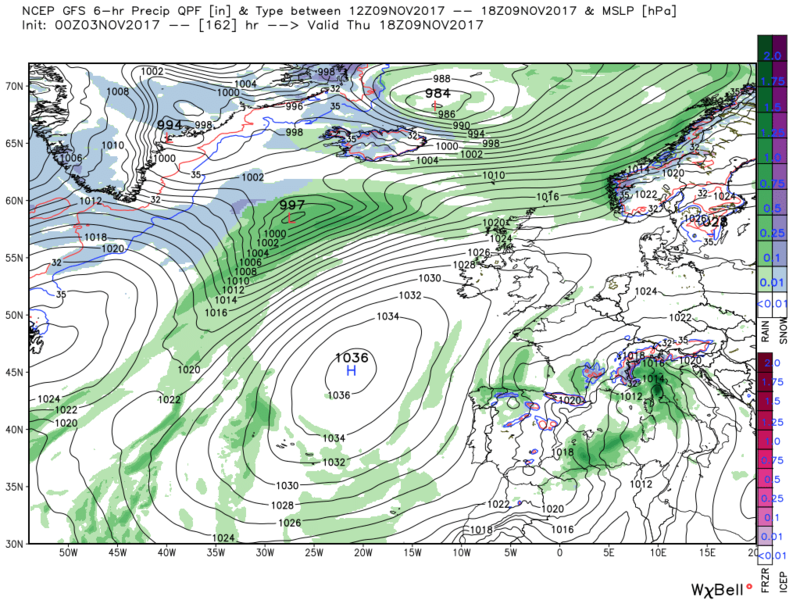 After the wave eventually clears Weds evening the Azores once again ridges north east but the gfs is once again entertaining the idea of explosice cyclogenesis and by 18 on Thursday has a low 997mb south west of Iceland tracking around the Azores high cell. 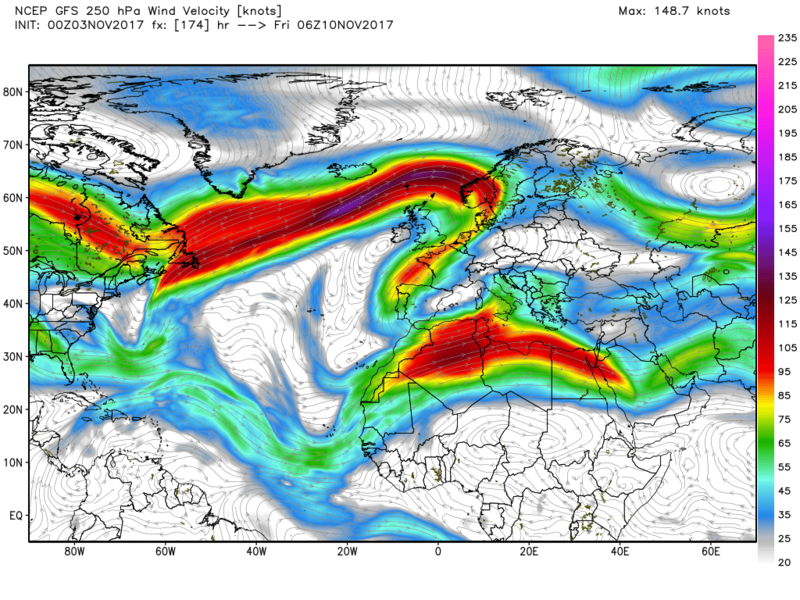 By 18 on Friday it is 965mb west of Norway traveling on the very strong jet and if this actually occurred, which is extremely unlikely, would bring some very nasty weather indeed to western Norway. 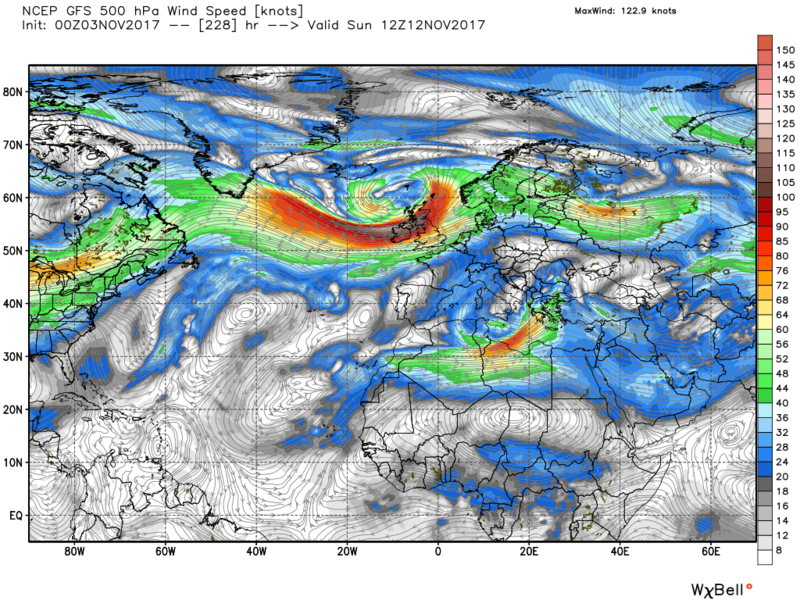 None of this would impact the UK very much apart from being quite windy in Scotland and a weak front tracking south. 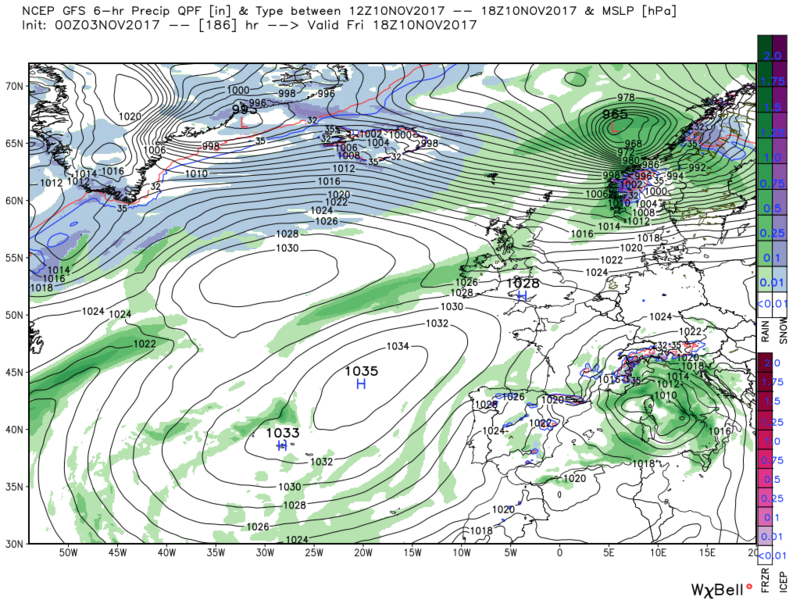 As mentioned none of this affects the UK but if the gfs is correct then the next depression and fronts certainly would. 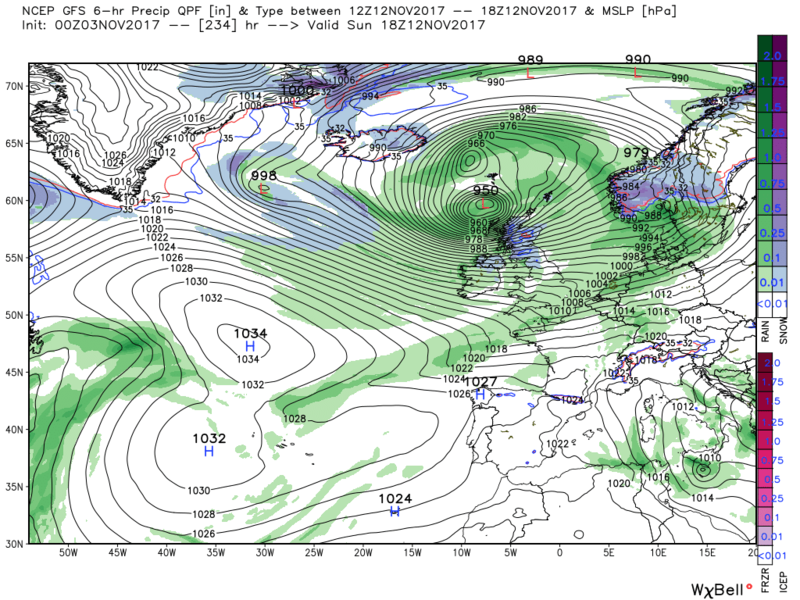 The fronts cross the country saturday night and the depression is 950mb north west of Scotland by 18 on Sunday, which if it came to pass, would bring some horrific weather to Scotland. Fortunately this will not happen but a watch will need to be kept on developing lows late next week. Just to add the latest EPS46 means update sees below normal temps in NW Europe (including the UK) for November but then trending above average until the 18th December. Excellent news for the early dafs. The ecm also tracks a low around the high cell next Friday on a strong jet but no great surprise it doesn't go in for explosive deepening. 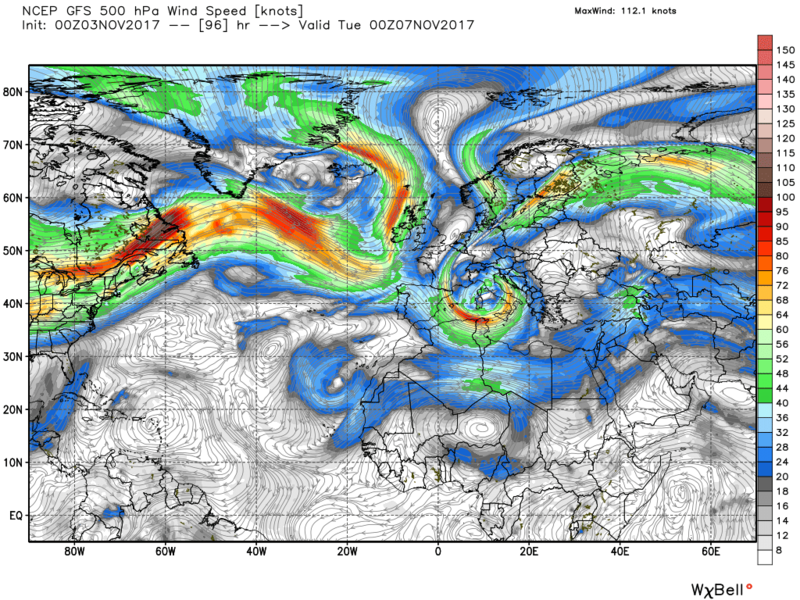 But as it tracks further south close to Scotland it does bring heavy rain and gales to the UK. 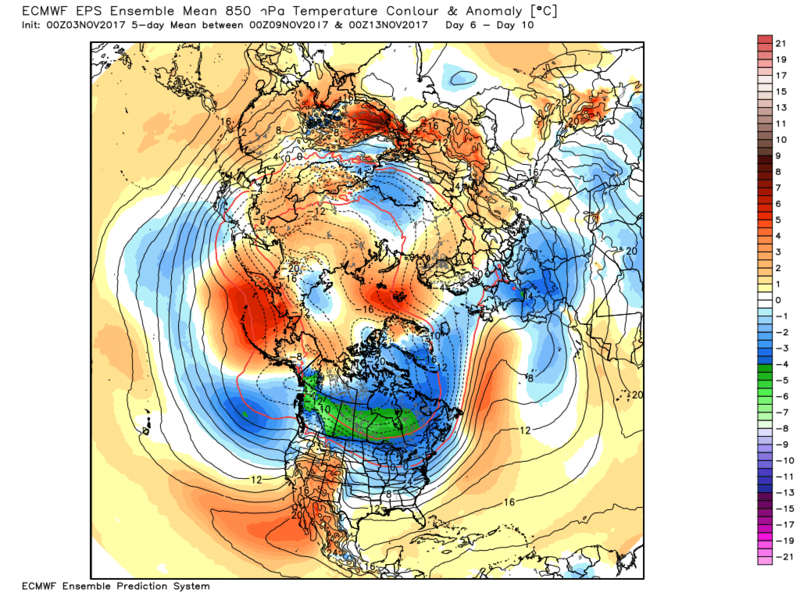 Yes, quite an interesting polar maritime flow at times on the EPS weekly control. Probably slightly overdone though and one can see it flattening out a bit if it ever even gets to the nearer term. The GFS continues to advertise a pm flow from the N/W into the run with Northerly shots as fronts pass and temps avg or just below at times, With the South remaining drier. 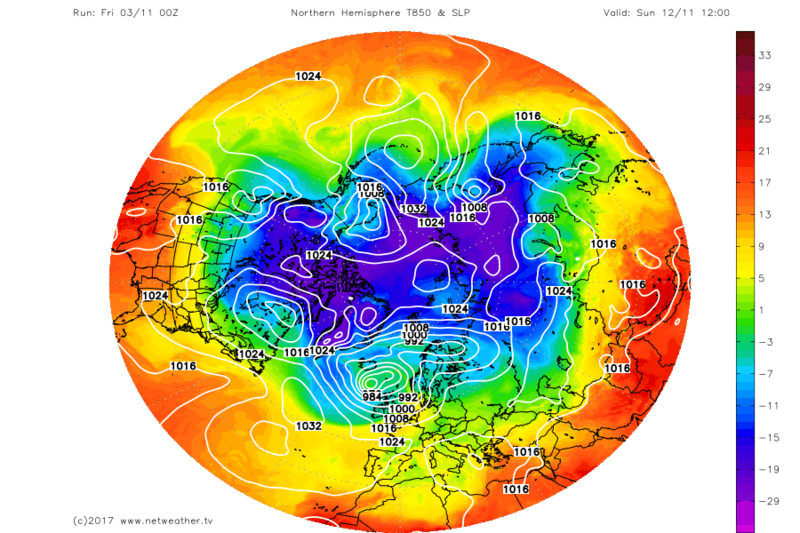 Yep, PM and that's nice to see with no Euro High in its usual residence at this time of year with Western continent Europe forecast to maintain lower heights than avergage. This latest picture from ECM ( 850mb temp anom) at 10 day sort of confirms what PM has mentioned regarding the GFS run and that's below or at best average temps in the main taking a hold over much of Western Europe as we approach the middle of the month and more importantly from my personnel perspective no Euro high in residence. 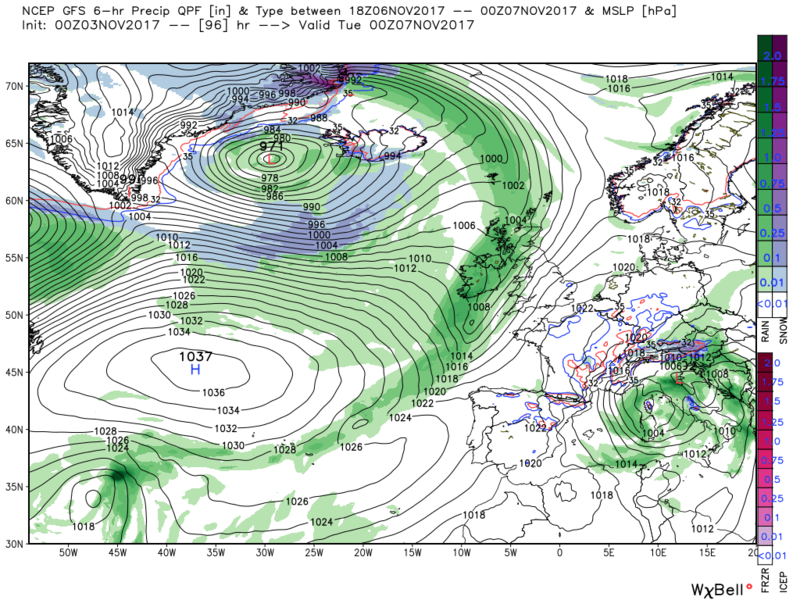 The little low that cuts off Wednesday next week and drops into NW Europe would have had us on the edge of our seats in the depths of winter with colder air in place. First it was there, then it wasn't, then it really wasn't, then it almost was, and now it is again! For me, it's just great to see high heights over the pole at this time of the year in the reliable frames. Again, not saying it will amount to anything as a whole this winter but is sure better than a blanket of black and purple up there. which would probably get the lamp-post watching brigade into full action. ... in that, perhaps, lows sink from a northerly position to a southerly one via Europe - and, eventually, the balance of troughing to the south outweighs troughing to the north and you end up with heights invading the weakness and occupying the region from the Atlantic up to Scandinavia. With the extra information available on EC clusters now, it is possible to track, to some degree, whether this kind of pattern is emerging (not completely as posting every single timeframe of the clusters would be information overload, but a snapshot can be of some use all the same). You can just about see that potential for movement of troughing from NW to SE, but the charts do underline how tentative the idea is as the third cluster shows no signs at all. The idea of heights to the NE and SW with a weakness in the middle is still there but northern blocking far less of a suggestion. The path for troughing from NW to SE pretty much gone now - perhaps a remote possibility on the second clsuter - and you'd imagine if the EC46 had been run today, the D18-D25 chart might look different as the logical progression from week 2 and week 3 is hard to spot. In a nutshell - I think this confirms the ECM is starting to trend away from troughing establishing over Europe in the long-term (in all honesty, they never really got there in the first place). However, it's just a trend, and at such a timeframe there's no reason why they couldn't trend back. Besides, lots of interesting GEFS members this morning to keep interest up. I don't have a problem with a longer range MOD thread although I think it totally unnecessary. In any case it would only be used when winter was on the table. For the rest of the year it could be renamed Dodo.  I do have a problem with limiting discussion in this thread to a week as I see nothing wrong with discussions up to at least 14 days using the tools at out disposal. But then I readily admit erudite discussion of the longer range models is way above my pay grade. The Model threads will be staying as they are, We have tried before opening a thread for +144hr in the past and it just doesn't work for the reasons Knocker points out, And during busy periods it can create confusion! Any model 'outputs' can be discussd in here, But comparing previous years and discussion on the upcoming winter/analogs are strictly for the Winter thread. Any further discusson on this please contact a member of the team. Well the 6z produces some interest later on and the METO update is interesting today- talking of settled weather taking control later in the month and into December- with fost and fog. Perhaps MOGREPS is seeing a strong block somwhere close or just to the north of the UK. 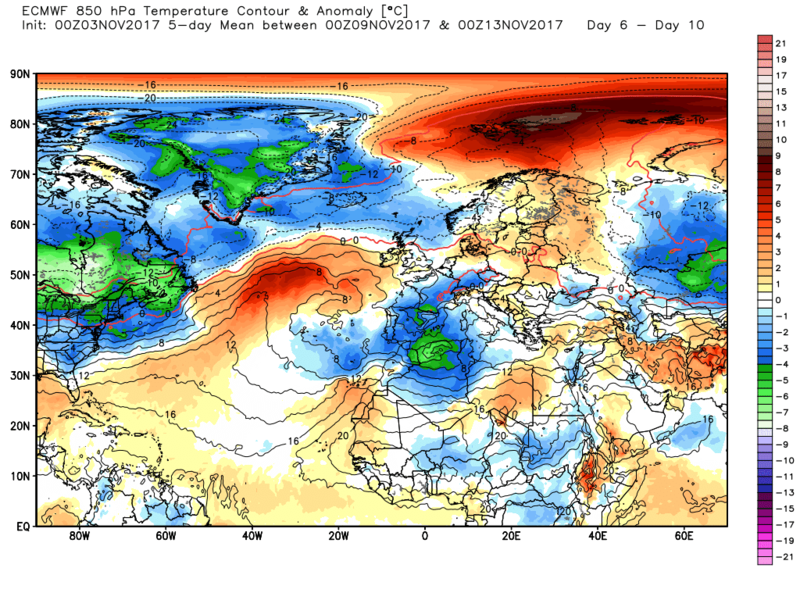 Edit with a mention of temps a little colder than average it suggests a block just to the east or north of the UK. 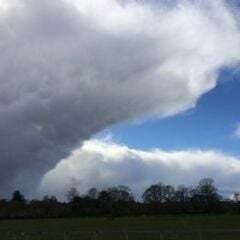 Yes, that's an improvement to yesterday's update which was talking of the weather getting more unsettled and temperatures recovering. Well i get a bit giddy at the thought of a cold foggy November!! So that update is music to my ears!! Would really enjoy the prospect of some walks in the pennines under these conditions. Will enjoy model watching over the next few days hoping to see a large anticyclone building in our locale. Fingers crossed! If November is to turn up frosty it would be an improvement to what we have experienced in the last few years regardless of what happens from December onwards.